I have always been a John Wayne fan and True Grit was one of my favorite movies. I bought a 1968 (first edition) copy of this book in a used book store and finally got around to reading it. There were many interesting things in the book that were different from the movie. There are many Biblical references in the book that are left out of the movie (I counted 11 specific discussions of Bible and religion). Portis has Mattie Ross at 14 years old which is much younger than the part played by Kim Darby. The book is more graphic in the details, for example, Mattie falls into the snake pit onto a skeleton which she has to break apart to fight off the snakes. In addition, LeBoeuf (played by Glenn Campbell in the movie) does not die in the book as he does in the movie. Also, in the end of the book, Rooster goes a different direction and never sees Mattie again, but she does find his body and brings it back to her family plot. 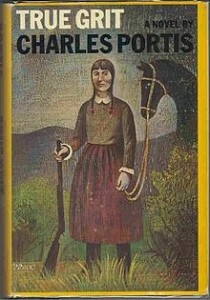 Portis, though maybe not a Zane Grey, still has an entertaining way of writing that keeps your attention.